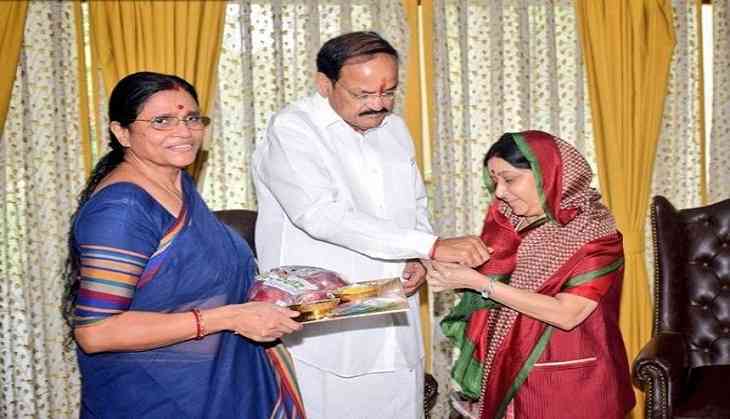 External Affairs Minister Sushma Swaraj on Sunday tied Rakhi to Vice President of India, Venkaiah Naidu on the occasion of Raksha Bandhan. Speaking on the occasion, Naidu greeted the nation, saying, "I convey my warm greetings and best wishes on the auspicious occasion of Rakshabandhan. The Festival reaffirms the strong bond of love and affection between brothers and sisters. It promotes and strengthens unity and harmonious coexistence." Raksha Bandhan is a Hindu festival that celebrates the love and bonding between brothers and sisters. On the day, sisters tie a rakhi on her brother's wrist, symbolising the former's love and prayers for the latter's well-being. President Ram Nath Kovind and Prime Minister Narendra Modi also wished the nation earlier in the day.